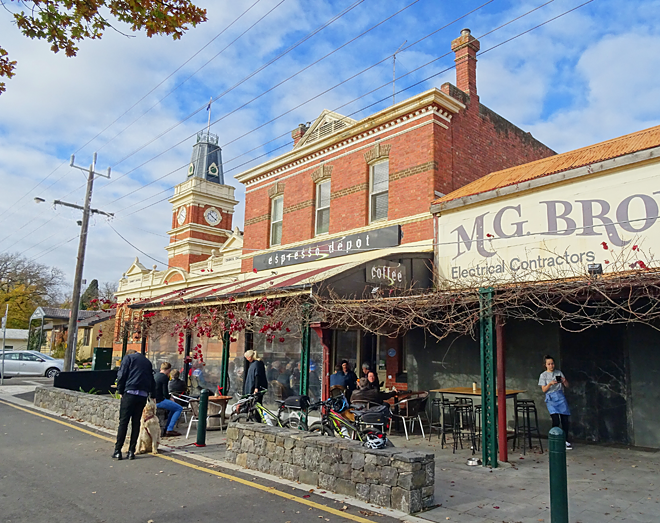 Restaurants, cafés, picnic areas, wineries, a monthly market with delicious fresh produce - there is plenty to savour in and around Buninyong. 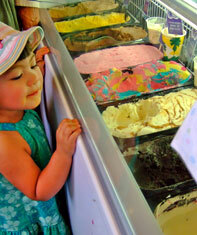 (left) Summer in Buninyong means ice cream. Mmm ... now, which flavour to choose? The Buninyong Village Market is held several times a year on the last Sunday of the month, usually in the Buninyong Town Hall Market Square, with occasional Twilight markets. Buninyong Blueberry Farm (seasonal) ... Innes Lane, Buninyong. Luscious fresh blueberries are on sale from Christmas and over January at the Buninyong Blueberry Farm. Drive in from the Midland Highway - turn off before Mt Buninyong Road to service road on south side of the highway. The blueberry farm puts on a gorgeous show (right) every autumn before the bushes enjoy a well-deserved rest over winter. 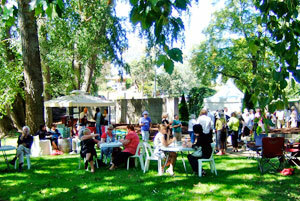 A delicious locally grown and prepared picnic meal was enjoyed by all in the Buninyong Botanic Gardens on Sunday 14 March, 2010. On a perfect autumn day, the feast featured a tasty paella dish with local wild rabbit, Wurrook gourmet barbecued sausages, free-range chicken, roasted whole pork with various locally-made condiments in sourdough rolls, pizza with a range of toppings including locally produced ham, salami and prosciutto and local vegetables, along with blueberry and hazelnut petite cakes for dessert. Locally produced wine, beer and mineral waters were savoured too.